* They never fly in the same aircraft. * Jeanne-Claude does not make drawing, she was not trained for that. Christo puts their ideas on paper, he never had an assistant in his studio. * Christo never had the pleasure of talking to their tax accountant. from “Common Errors” on the Christo and Jeanne-Claude Website. Christo, whose work has always been more Euro-Pop than conceptualist, sometimes claims his work is primarily a matter of the aesthetic. This stops people in their tracks. He said this in Umbrellas, a well-received 1995 documentary directed by Albert Maysles, Henry Coora and Grahame Weinbrien about the Christo and Jeanne-Claude project involving the placement of giant very large umbrellas in Japan (blue) and California (yellow). Christo, usually patience personified, seemed to have lost his temper on camera when pressured to order the opening of the 1,230 Japanese umbrellas before he was ready to, because it was raining. His decision was a matter of aesthetics. Period. End of quibbling. 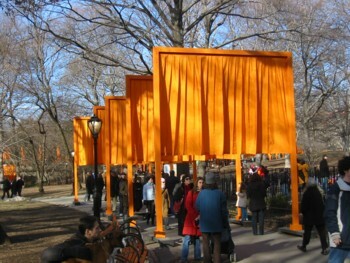 Are the large-scale Christo and Jeanne-Claude events, like the long-planned The Gates in Central Park New York City (February 12 to 27) primarily aesthetic? When it comes to The Gates, alas, yes. What was so powerful about Christo and Jeanne-Claude’s Wrapped Reichstag (1995) was that it was not exclusively aesthetic; one cannot exempt what is wrapped from the meanings of the wrapping or vice versa. What was of interest in Valley Curtain (1972) and Running Fence (1976) was the sarcastic use of boundaries which must (unless you are tone-deaf to meaning) cast some reflection on boundaries and borders in real life. Christo was born in 1935 in Bulgaria, which suggests he might be aware of political dividing lines. His off-the-cuff remark about aesthetics may have been situation-specific, but it can also be taken as a reflection of the artist’s naivety — or perhaps duplicity. Each project requires so much fund-raising and so much organizing of personnel that anything less than the aesthetic as content might stand in the way. Beauty, particularly when the word means the theatrical, sells. The process of large numbers of people setting up umbrellas or orange, pleatedcafé curtains on outsize door frames also attracts the unwary and the needful, so universal is the nostalgia for group activities and participation. To give Christo and Jean-Claude their due, their projects do not utilize one cent of public money. They are mostly financed through very attractive, but academic, drawings that function as pre-souvenirs. This, and not any particular manifestation, is an earmark of their genius. They are, as they relate on their Website, their own art dealers, selling to “Museums, art collectors, art dealers and galleries.” I say the projects are temporary, but the souvenirs are eternal. As are the thousands of professional and by now millions of amateur photographs taken of each temporary deportment of endless yards of fabric. As an artist friend once told me, if an artwork can’t be photographed, then it doesn’t exist. This of course is a little different from the Christo projects. The difference is semantically subtle. Christo and Jean-Claude make art that’s more than camera-ready; it exists only to be photographed. It is best enjoyed through a lens. 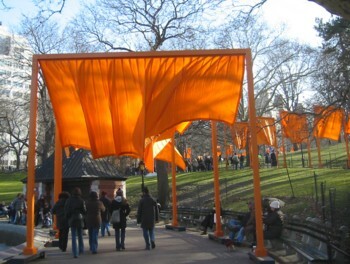 Unfortunately, if the Christo manifestations are meant to be primarily aesthetic and thereby to function as photo-ops – how old-fashioned — then The Gates were not entirely successful. If you will excuse the pun, they did not hang together. Spread out along the pathways of Central Park, they were spread too thin. You needed to look at clots of them at certain angles to get any feeling of density. Up a hill, down a hill. Otherwise you had to wait for a breeze strong enough to make them billow and take on some form. People seem to like walking beneath them and certainly photographing them; some also wore orange in honor of the photo-op. But did we really need Christo/J.C. to tell us that Central Park is a really fine place for a promenade? In light of what I have written previously about photographing art, constant readers might be interested in my efforts to capture The Gates with my Elf. I had to struggle with intention. Did I want to make them look better than they were, or worse? The trouble with allowing photography (whether digital or otherwise) to define the art is that imaging technology is more about framing and flattening than about truth. 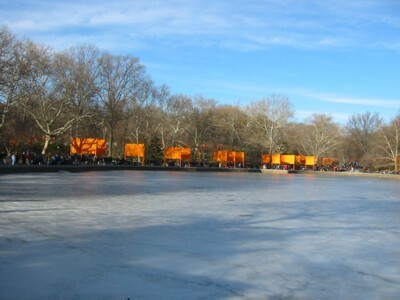 How do you capture within a frame how big and beautiful Central Park itself is, even in winter, in comparison to Christo’s wee orange banners? How do you photograph the varied interaction between nature and culture all around you in contrast to the fabric flags planted like dotted lines along the already artificial hills and dales? Artifice disguised as nature, which is what Olmstead and Vaux achieved, does not need one more layer of artifice. This is not to say that Christo and Jean-Claude will not come up with bigger and better projects. However, seeing The Gates in reality, rather than as preview drawings or through after-the-fact photographs, forces unfortunate comparisons. It makes one wonder about previous Christo projects. Were they equally unimpressive to the untamed eye? And here’s the real subject to chew on: Does it make any difference? 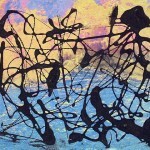 A topic worth looking at is how artists present themselves. Take a good look at the Christo and Jeanne-Claude Website, particularly the section called “Common Errors.” I both printed it out and saved it on my hard-drive for future use, because it turns out to be hilarious. It will certainly come in handy when and if I again conduct my popular, exhausting (for me), psychotherapeutic workshop called “How to Present Your Art and How to Present Yourself”. Yes, I was glad to know that the Christo and Jeanne-Claude never use volunteers, whereas I thought they did. Everyone is paid, except Jeanne-Claude’s mother. Christo and Jeanne-Claude seem to make no profit at all and never take vacations. They are saints. Although Christo and/or Jeanne-Claude love to scold journalists, we also learn the ins and outs of their names and how to correctly address them. Although Christo was originally the first name of the Bulgarian of the pair, their son has Christo as a surname. At one point Christo made academic portraits for a living. They still live in and sell their art in their Soho fifth floor walkup. P.S. Want an action-hero Andy Warhol doll, available in both a1960s and a 1980s version? Try this Japanese Website then search for Andy Warhol. I wonder if the silver wig comes off and if the 1980s doll has the gunshot scars….Could we also have Pollock and de Kooning action figures ? Or a Jeff Koons? How about an action-hero Clement Greenberg doll?